Place the parcels onto a non-stick baking tray and drizzle them with olive oil. Bake for 15 minutes, or until the fish is opaque and flakes easily. When cooked, sprinkle with lemon juice. 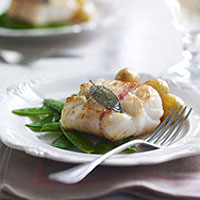 the cod and artichoke: Sant’Elisa Friulano 2008 Grave del Friuli, Italy.